What is Title? Do you know? Even with its importance in Real Estate transactions, many don’t really know much about Title. Understanding it can save everyone a tremendous amount of time and frustration. Let us tell you everything you need to know about it! Most people understand the need for homeowner’s insurance which protect them from fire, theft, and other perils. 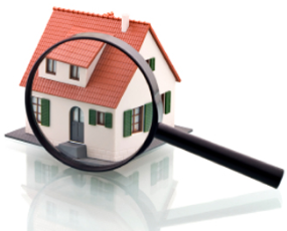 Title Insurance, on the other hand, protects the homeowner’s investment against “hidden defects” in the title of the property, which can include fraud, forgery, mental incompetence, and more. There are two types of policies. There is the Owner’s title policy and the Lender’s title policy. The Owner’s policy protects the buyer’s equity in the property (up to the purchase price) while the Lender’s policy protects the lender’s interest in the property, as security, for the outstanding balance of the buyer’s mortgage. Some common acronyms used in title are HUD-1, RESPA, and FIRPTA. HUD stands for Housing and Urban Development. It is also commonly referred to as a Settlement or Closing Statement. RESPA stands for Real Estate Settlement Procedures Act and represents a set of legislative statues relating to real estate transactions. FIRPTA stands for Foreign Investment in Real Property Tax Act of 1980 and deals with the disposition of a US real property interest by any foreign person or corporation. A simple way of knowing if this will pertain to you is to just ask, “Are you a legal US citizen?” at any listing presentation. It is important to note that all buyer’s and seller’s must have a social security number or an individual tax identification number in order to complete any transaction. There are things you should always be listening for from your client that can help you. These phrases should prompt you to ask further questions and insure you understand the situation completely. Nursing home, Power of Attorney, dead (or died), getting married, divorce. Without complete information into any of these phrases a title issue could loom. Having all the right resources in hand can help with from the very beginning. 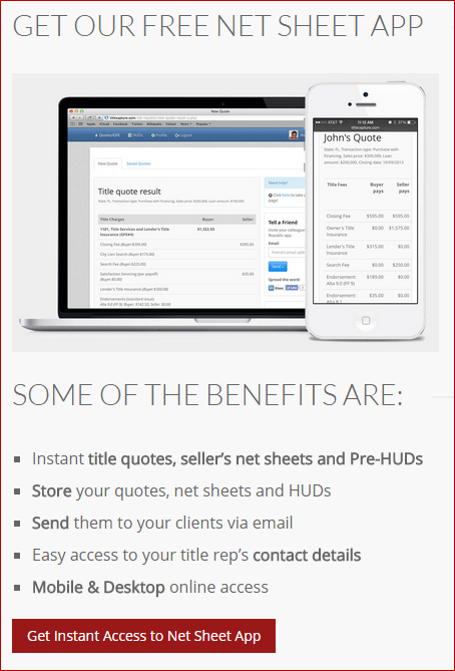 One of the best resources to have is to be able to receive instant title quotes, seller’s net sheets and Pre-HUD statements, all with just a few clicks. You get even place a title order, right from your smart phone. 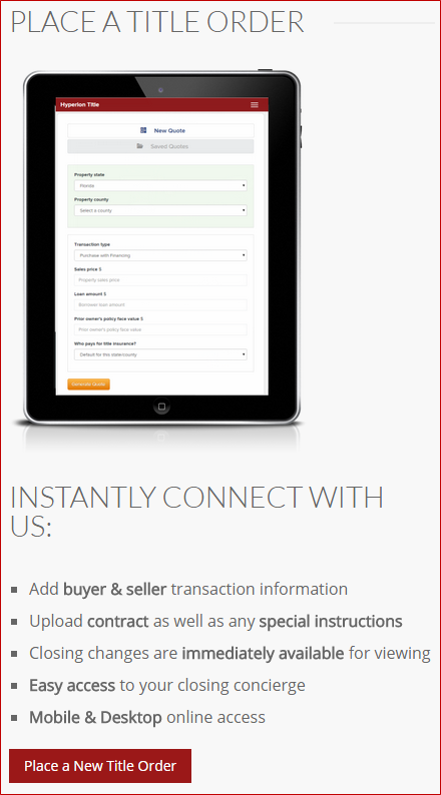 Download our Net Sheet App here today to get started. To learn more about Title, download our Free E-book here. I’m amazed, I must say. Rarely do I come across a blog that’s both educative and engaging, and without a doubt, you’ve hit the nail on the head. The problem is something that not enough folks are speaking intelligently about. I’m very happy that I stumbled across this during my hunt for something regarding this.